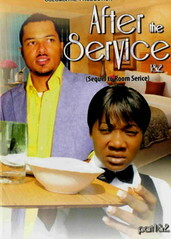 Derek Douglas played by Van Vicker is a huge celebrity actor. A date with one of his female fans Lily played by Bimbo Akintola is the start of big drama. He decides to surprise the fan by turning up to her hotel room to take her out for dinner. Little does he know that the one he chats to on the internet called Miss Spiffy was not in the hotel room that day but rather the maid Gina, played by Mercy Johnson who was trying on her clothes. They end up going on a date together and so starts the web of deceit based on mistaken identity. My chick Mercy Johnson never disappoints. My only issue with Mercy is that she needs to start doing “a Genevieve” to really catapult her status. She is such a good actress and she needs to start being more selective with the projects she chooses to work on. Bimbo Akintola is another one that doesn’t disappoint. She played the spoilt desperate rich girl without fault. Her next movie needs to be in a leading role. You wait all this time for her to star in something and then you still don’t feel like you got enough. Nuella Njubigbo was good. I don’t think she gets challenging enough roles though. I remember seeing her in a village movie a few years ago, perhaps it was Heart of a Slave and she had a very small role but she stood out for me. She is getting bigger roles now but nothing that is yet to be her defining moment. 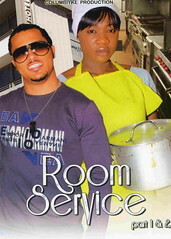 Van Vicker was decent in this movie. I even believed his crying at the end of the movie. This is progress I tell ya. Micheal Godson is a hottie. His role wasn’t large enough for me to comment on his perfomance but I surely loved the eye candy. Eric Nwadinobi is now going by Eric Davidson. In this movie he was playing Derek’s sidekick. He can change his name as many times as he likes but we won’t forget how he previously contributed to wrecking movies. He actually decent in this one though although his role was minimal. I was so shocked at the 100% improvement. I remember him from Annabel, remember that movie with Nkiru Sylvanus? (one of my favourites might I add) He was so annoying in that movie. Haven’t seen him for years but I guess that time away did his acting the world of good. This bit did not make sense to me. Why Anita wouldn’t just try it on herself? Was her body much more or much less than Gina’s? She was the one gushing about how the dress was Vivian Westwood and Gina was not at all interested so why would you badger someone else to try it on and not just try it onl yourself? It wasn’t like she couldn’t fit in the dress, after all Bimbo Akintola is bigger in stature than Nuella Njubigbo. Perhaps if she had been trying to make her over previously this would have made sense but as it was it didn’t make sense. Gina was way too honest for my liking. She should have never admitted that she wore the woman’s dress. That is the sort of thing you deny until the end, especially if you are a maid with a nephew to look after and might lose your job. If I was Lily I would have been overpissed. Can you imagine? The maid comes to steal your dressyou’re your man? Na wa ooo! What service did Lily pay Derek for? Why would a huge star accept payment from a fan simply to meet? I thought that the “I love you” that Derek told to Gina was so fake. They had barely had any interaction and on their date Gina didn’t even talk much so what did he love? Was it just the fact that she is beautiful as he keeps stating over and over? Why is Gina so hostile towards Derek at the beginning of the movie? She should be apologetic considering that she essentially tricked him but yet she is there shouting at him. SHE was the one that did wrong not him. Why doesn’t she want to go out with him? She has nothing to lose she is already jobless so she may as well enjoy the trappings of dating a celebrity. Gina’s sister Juliet ended up in a wheelchair all at the hands of Derek Douglas a guy who at the time when she met him was already as she said a big movie star. Why wouldn’t Gina know about him at all? Who wouldn’t tell their sister that they seem close to that they are dating and then even got pregnant for a huge celebrity? Why even after her sister comes to live with her hasn’t she said that she is going out with a huge celebrity. Who keeps that quiet? Hmmmm very strange. Why when the sister sees the picture doesn’t she mention the movie star stuff? That whole scene where sister sees the photo of Derek and Gina was very badly done in my opinion. Why are they all crying at the end like Juliet is dying? Before Derek came along she was resigned to spending her life in the wheelchair so what changed? From just watching this movie alone you would think that someone in a wheelchair cannot look after their child or ever find love again. They are all sobbing like she has been told she has a week to live. I found it very overdramatic and for no good reason. When Derek walks into the room where the two women are initially sobbing he says, what’s wrong? Why would he say that considering that he was at the doctor’s appointment where she was told she wouldn’t be able to walk? For me the ending was an anticlimax and quite disappointing. I absolutely loved the scene where the male maid Amos comes in and catches Gina in “Madam’s” clothes. The look on his face was priceless as was the way that Gina and her friend Anita tried to usher him out. Nuella Njubigbo, Mercy Johnson and Timothy Obiefule were awesome in this scene. That truly was great acting. ***What was all the beginning bit about with Derek and Bisi? How did that fit into the story? Why didn’t she want to marry him? Did I miss something there? ***Derek was famous from his school days so why would he need Madam Betty as his sugar mummy; Juliet has already said he was very rich back then. I would recommend this movie. It was nowhere near as good as Ikenna Emma Aniekwe’s recent offering Parish House but it showed a lot of promise. Where it fell down for me was the continuation – After The Service. The story changed completely and it didn’t tie up too well. It would have given a better overall rating, had I just watched Room Service without watching After the Service, nevertheless it is still worth watching. i just got this movie, and i will watch it very soon. Yes mercy needs to step up to more challenging roles cuz it seems like she's fading. as long as bimbo akintola is in here, i'm very excited about this. she always brings in class and maturity to all her movies. not concerned about van vicker…the craze is over for me! i love nuella…soo cute and her acting is not bad. I would definitely be interested to hear your assessment on it… Correct gal why have you not updated in so long? Yes and to be fair it is nowhere near a direct copy of Maid in Manhattan. The similarity begins and ends with a wealthy hotel customer falling in love with a maid. Lemme know what you think when you finish watching After The Service. oh WHY WHY WHY…? d synopsis of dis movie already reminds me of maid in manhattan, nw i'm beginning 2 hv doubts abt watching it…i hp itz nt an exact replica tho…will return after i hv seen d movie. Cheers Nolly! The general concept is the same but that is as far as the similarity goes. Your review is so on point Nolly….the emotions in "after the service" where so over stretched. I think Nuella should get bigger roles cos she'z rily gud and Queen Nwokoye(Juliet) should start refusing all these wheel chair/over rated emotional roles….d stereotype is too much!! all the same it was watchable! Thanks! I've really grown to like Queen too in the past year in comparison to when I first started to watch her and couldn't bear her. Madam,you're doing a great job but this time,i dont think you got it quite well.maybe because you have too many work on your table or you dont watch films well.i dont't think some of those your submissions or observations about "ROOM SERVICE"were correct because i was on that set;and what you see in that movie is not what we did.so i suggest you sit down again and watch that movie well again,and ofcourse every other movie before you make your reviews and or judgements. What observations are you suggesting are not "correct"? If it is what I am seeing – JUST ME, then it is correct to me. Even if I am hallucinating then to ME it is correct. I would be interested to know which observations you are referring to though. I would also like to know if you have watched the finished product because being on the set is one thing and the finished edited product is another. OK, I watched the room service on Monday, still to watch after the service. Thought the story line was good but it was very slow, for me. Its like those 4 parts should have been only 2 parts,,,,but anyway it is realy a grt movie,,,and u just gotta LOVE Mercy more and more, oh this child , I have no words but I am happy God has blessed her this much considering that she is from a v poor family. today am gonna watch after the service, since yesterday I couldn't watch (was celebrating ma birthday). Yes I agree it was ruined by the length, it started to feel draggy. Was a good story. All the characters did very well. A little too much crying, as usual on mercy's part. But, on a whole her acting was still good. Van, as usual was remarkable. his acting skills seems to be improving by the minute. Not to leave out the other characters; but like I said before they all did well. On a whole good movie. I'd give it a high c+. LMAO I High C plus equates to to 50% to me. Its aight. funny I actually preferred the first two parts. Yes room service was better than after the service.The story took a different and unrelated turn.However,I am a Van fan.I like his acting and yes he's getting stronger as a actor.The man is also serious eye candy and has a great screen prescence.As for mercy,I love her and think she's a decent actor,but She needs to step up the grooming.Get better quality hair and generally put herself together a little better.I have no comments about Queen.I think am still where you used to be with her. Overall the movie is very watchable.I enjoyed it. I agree with the eye candy comment, but at the same time when there is not that strong acting talent to go with the undeniable good looks it gets boring, well for me it does! It was a good movie, even thoughh i couldn't really figure out if the prt2 was actually the continuation or a different story? I didn't really like the end to be honest,it didnt seem very realistic to me,obviously it's good that they got togetether and that, but the way she just jumped att him(mercy johnson) and both of them kept smiling and laughing all the way to the car was just too much and she didnt even say proper thanks to her friend or even a little "see you".But at the end of the day it is only a movie so in a movie kinda way i'd say it was really good,all the actors were great..mercy johnson is a great actress, and nuella njugbibo fited so well in the role,van vicker is improving and getting better he is kinda good actor now,anyways i betta stop writing before my fingers get twisted Lol. Yes After The Service was the continuation it just took on a very different angle. The vehicle owner should comply strictly with the manufacturer. month on gas, depending on how much you drive. Zhou was driving a light Wuling Car To act in the vicinity of City Youth Palace. men act foolishly around them and the best way to overcome being the loser guy who lets the top women slip away.